Pro Se Productions once more proves to be a leader in genre fiction with its latest release. A man of the far future plying his dangerous trade like one of the past. 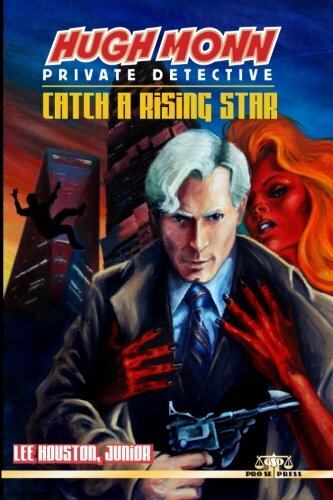 1950s Sensibilities collide explosively with Science Fiction Action and Danger once again as Lee Houston, Jr. follows up his debut 2012 collection with HUGH MONN, PRIVATE DETECTIVE: CATCH A RISING STAR! Thick, red lips were just a shade darker than her crimson skin tone, but both were in striking contrast to her long orange hair. Her eyes appeared to be only irises, as black as a starless corner of the universe resting on a field of white, but that toothy smile was brighter than a supernova. She was dressed in white like everyone else, but her outfit was a sleeveless, short hemmed number at least one size too small, that did everything possible to accent every aspect of her figure. suits, so I couldn’t identify any of their races or species. Besides, the woman was the only one present any insensitive jerk would call ‘alien’. Outwardly, all the men appeared to be as human as me. “There’s no pleasure involved from my perspective,” I said, while motioning my head to indicate his traveling companions. Hugh Monn, the private detective of the far flung future, is back in his first full length adventure! In Lee Houston's latest installment of his 1950s style detective in the future, Hugh is hired as a security consultant when actress Ruby Kwartz comes to the island nation of Galveston 2 to record a new vid. What is supposed to be an easy assignment turns deadly when Monn discovers that everyone around Ruby has a hidden agenda and someone wants to make sure this production will be her last. Can Hugh Monn catch a rising star before she falls? "After writing short stories for his first book," states Houston, "I wanted to create longer adventures for Hugh in a second anthology, but CATCH A RISING STAR took on a life of its own and became his first full length novel. Fans of the private detective in the far flung future not only get more action, adventure, and mystery in this tale; but more Big Louie too." "We're excited," comments Tommy Hancock, Pro Se Partner and Editor in Chief, "to not only have Hugh back for another adventure, but to see Lee push both himself and this wonderful world he's imagined into a full length novel. The definitely different mix of Science Fiction with the Detective genre as well as Lee's placing of Hugh somewhere along the center of the Private Eye spectrum makes the concept a fun, exciting one and one that appeals to many types of readers." For More Information on the author, visit his Pro Se page at http://prose-press.com/lee-houston-jr-staffauthor. For more about Pro Se itself, go to www.prose-press.com. PRO SE PRESENTS-THE PODCAST SPOTLIGHTS LATEST HUGH MONN ADVENTURE!